could ever, thereafter, let it go. everything it needed to know. Wall, wall, reed wall, reed wall is generally the first line of the Babylonian versions of the Flood Story. In fact, the first non-Biblical translation of the myth in the 1870’s rocked the Victorian age and was the opening salvo in the modern-day battle to contend that the Old Testament is not a history book, but one of spiritual metaphors. Since then, further research has proven that the Mesopotamian Flood myth far predates the creation of Genesis and firmly establishes that the story, which is so central to that entire region’s psychology and conscious, is most probably based on some real cataclysmic event of the long distant past. A leading contender for that event in the creation of the Bosphorus seaway. It is speculated that the creation of this amazingly narrow, thread-like sea channel that cuts through modern-day Istanbul and connects the Mediterranean to the Black Sea, is the cause. Formed in 5,600 BC (agriculture had by then created villages and towns, but had not yet flared into cities and city-states) it is suggested that the Black Sea was then a fresh water lake which had much shrunk in size due to the lack of melt water from the glaciers which had long since retreated north. However, on the other side of the land bridge, the levels of the Mediterranean had grown much higher, again owing to the ending of the Ice Age. These dual-pressures finally and terribly exploded into the creation of the Bosphorus, which would have discharged into the Black Sea three times the flow of Niagara Falls for over three hundred years before levels equaled. The resulting constant growth of the Black Sea, and the pressure of a steadily advancing shore line could have, it is suggested, created the Flood myth. A few notes: “shanna” (pronounced SHAW-naw) is the Babylonian word for “by twos” and is specifically used in the oldest version of the tale known. “Ridván” (pronounced RIZ-von) is the Arabic word for “paradise” and is used in the Bahá’í Faith in several contexts; in the poem it refers to both the Covenant and a state of spiritual bliss. In the end, regardless of the story’s origin, the power of the Flood myth to teach the importance of obedience and trust in God, as well as a symbol of the eternal Covenant of God is undiminished. Thank you for reading The Holy Mariner. I humbly appreciate your visiting the Book of Pain, and as always, I look forward to your comments. 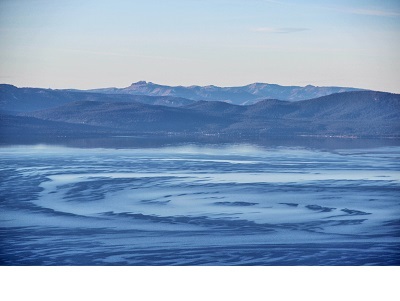 The photograph of Lake Tahoe was taken from the Heavenly ski hill, observation deck and shows the Coriolis effect created by the wind swirling in the valley bowl in which the lake rests. For more photography, please visit the Book of Bokeh. flickering like a taper in the night. next to gutter—finally it gave out with a puff. tearing out what little heart we had left. Surely the Book of God is sufficient unto us! was that second volley of seven hundred and fifty rounds. This poem is about the Martyrdom of the Báb, the Prophet-Herald of the Bahá’í Faith, an event which took place in Tabriz, Irán on July 9, 1850. But it is also about a geo-political reality that affects us today, the splitting of Islám into two branches, Sunní and Shí’ah, and how these two historical events are intertwined. Both stories are complex, but I will try to keep the explanation short. I should state at the outset that, like Christians are not Jews, Bahá’ís are not Muslims. Let me explain: Christianity is its own independent religion, as is Judaism—yet the Founder of Christianity was born a Jew and Christians believe in, and accept, the Divinity of the Jewish Prophets; as a Bahá’í I believe in, and accept the Divinity of the Prophet Muhammad, and Bahá’u’lláh, the Founder of the Bahá’í Faith was born a Muslim. But I am not a Muslim. The Bahá’í Faith is, like Judaism, Christianity, Islám, Buddhism and Hinduism, an independent, world religion. The linkage of the Martyrdom of the Báb to the split of Islám into it’s two main branches is more complex. To understand that, you have to understand how Islám was divided at all. At root was the question of succession to the Prophet Muhammad, the Founder of Islám. Sunnís believe that the succession was properly followed through the election of a series of Caliphs, starting with Abu-Bakr, a wise, elderly man, a long time personal friend of the Prophet and an an early convert to Islám. Such a process of succession would have been typical in any major clan decision in Arabia at that time. Hence its quick acceptance by the majority of Muslims of the day. The second Caliph (this is important when it comes to the explanation of the Shí’ah branch of Islám) was ‘Umar Ibn al-Khattab, a fiery, driven person who was also an early convert to Islám. Shí’ahs, on the other hand, contend that Muhammad had publicly designated His son-in-law, Alí, as His chosen successor at a sermon given in the last year of His life at the pool of Khum. Moreover they believe that shortly before His passing, Muhammad asked for writing materials to be brought, so that He could dictate His last wishes with regard to succession, but that ‘Umar interdicted that command, saying that the Prophet was delirious from His illness and that, “The Book of God [referring to Islám’s Holy Book, the Qur’án] sufficeth us.” This act, Shí’ahs contend, scuttled hope for a unified Islám, caused the separation that still effects us today and ensured that ‘Umar himself would one day secure the leadership of Islám, especially since Abu-Bakr, the first obvious choice, was an elderly man. Today, the Sunní branch occupies the western portion of Islám, up to the northern two thirds of Iráq. The Shí’ah portion occupies the remaining one third portion of Iráq and continues on into the east, through Irán and into Afghanistan. Pakistan and into the Pacific, however, reverses this trend and is mostly Sunní. The division point between the two branches explains the current inter-Islám warfare that goes on in the south of Iráq and, therefore, much of the current political turmoil in that country. ‘Abdu’l-Bahá, son of the Founder of the Bahá’í Faith, and Himself the Leader of the Bahá’í Faith after His Father’s passing, states that the musket bullets used by the regiment to kill the Báb were made from the statement made by ‘Umar as Muhammad lay dying. He means, by this, I think, that the statement, “The Book of God sufficeth us,” (or the Book of God is sufficient unto us as it is cast in the poem) is corruptive in that it put ‘Umar’s personal will over the Will of God. Moreover, the method used—to dignify and justify such an act with reference to the Book of God—is particularly wrong as it coats ‘Umar’s ambition with a false sense of purity and holiness. In so doing, and in this context and at this extreme measure, it is a betrayal and attack on the ancient and enduring Covenant by which God directs man. The consequences of that one act, in its introduction of disunity, still resonate within Islám and the world today. In the end, what more heinous act can be committed by man than to willingly reject God’s Messenger to this world? And what more terrible way to do that than to coat the act as one performed out of piety and faith? If you have made it this far, I sincerely thank you for reading To the test with its overlong explanation. I sincerely hope you have enjoyed it and I humbly appreciate your visiting the Book of Pain. As always, I look forward to your comments.